Sustainable Developmental Goal 16 (SDG 16) aspires to promote peaceful and inclusive societies for sustainable development, provide access to justice for all and build effective, accountable and inclusive institutions at all levels. The World Bank defines intentional homicides as estimates of unlawful homicides purposely inflicted as a result of domestic disputes, interpersonal violence, violent conflicts over land resources, inter-gang violence over turf or control, and predatory violence and killing by armed groups. 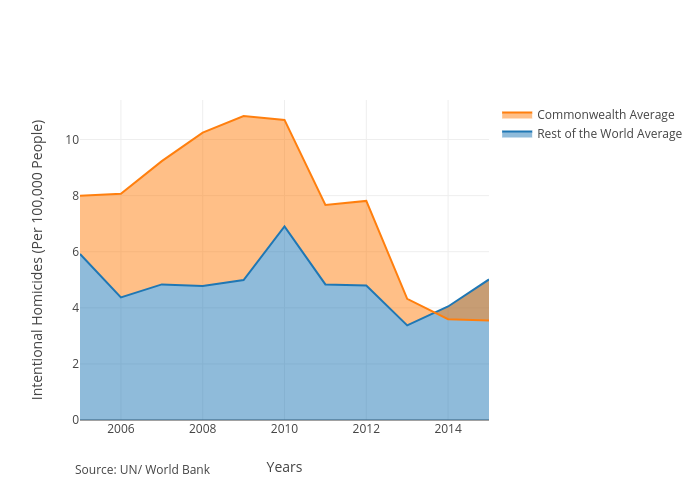 Between 2005 and 2015, the Commonwealth average for intentional homicides per 100,000 people decreased from approximately 8.00 in 2005 to 3.55 in 2015. By 2015, the Commonwealth average was nearly one-and-a-half times lower than the global average. As a group, European member states have collectively recorded the lowest levels of intentional homicide, with the Caribbean and the Americas showing the highest average across the eleven-year period.